It is possible to build bridges of mutual respect, understanding and cooperation out of love in action. I am teaching an elective course on Muslim-Christian Dialogue and Cooperation for Nation-Building to college students under the Department of Interdisciplinary Studies of the Ateneo de Manila University. I have one Muslim student in class, but the rest are Catholics. 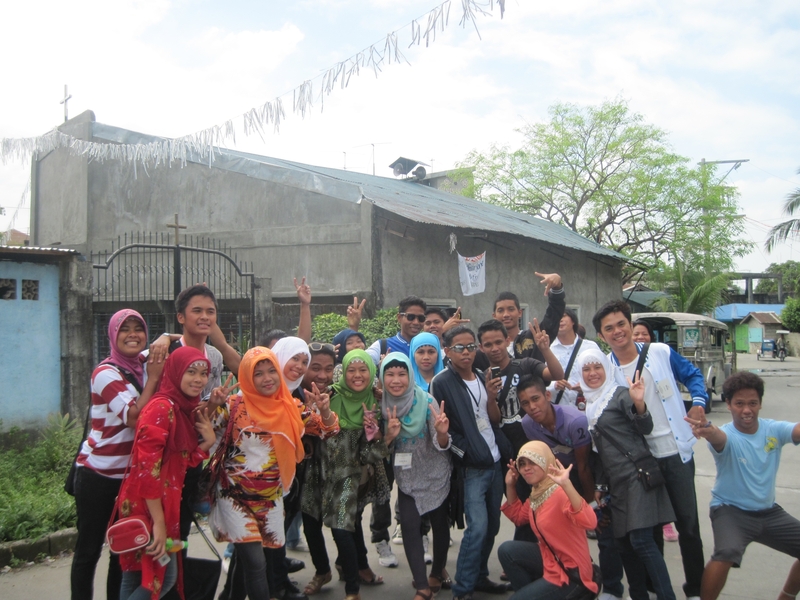 Finding creative ways of educating these young leaders–on the issues involved in the Mindanao conflict–and developing in them capacities for critical thinking as well as healthy attitudes of respect for Muslims out of their familiarity with Islamic teachings, is a challenge I continue to strive to respond to and find meaning in. One day I encouraged the girls in my class to wear a hijab (veil), and the boys to wear a taqiyah (skullcap) to school the whole day as a way of promoting awareness of and interest among members of the university community in attending a forum on Locating Women’s Rights in Islam using the Sharia Framework that our class organized. I received various responses from students. Some of them had the courage to wear the Muslim garb only at the forum, while a few others did so for only some limited stretch of time during the day albeit with a sense of apprehension. This reflection of Anna Raina, one of my Catholic students who dared wear the hijab to school the whole day makes what I do worth carrying on despite the overwhelming tide of anti-Islamic sentiments that threatens to drown tiny voices like mine crying to keep the hope for peace alive in our wounded midst. Posted in Dialogue of faiths. We at The Peacemakers’ Circle celebrated this year’s World Interfaith Harmony Week in the spirit of thanksgiving for the gifts of friendship and the joys of oneness with friends in the interfaith movement. Together we shared hopes, dreams, and aspirations for peace and harmony in the world! 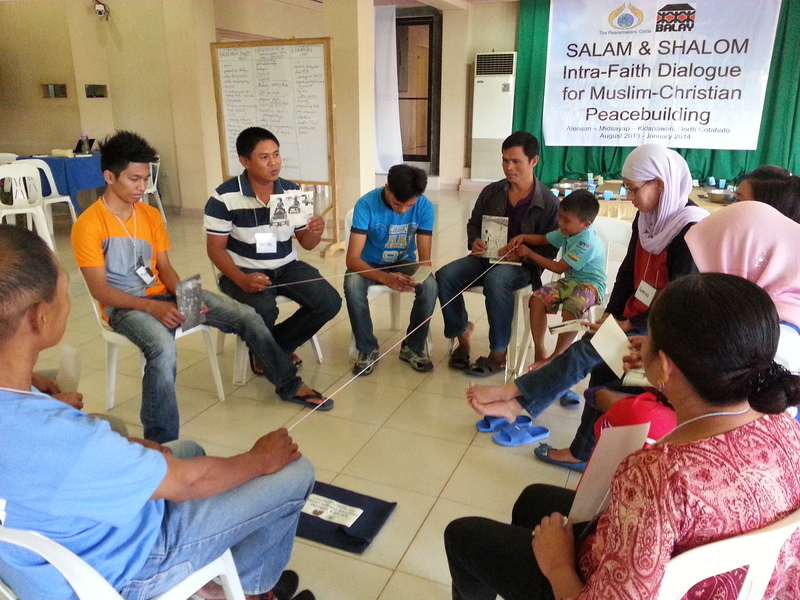 We launched the week’s activities in North Cotabato, Mindanao where we conducted a 3-day training workshop on INTERFAITH DIALOGUE FOR MUSLIM-CHRISTIAN UNDERSTANDING & COOPERATION. 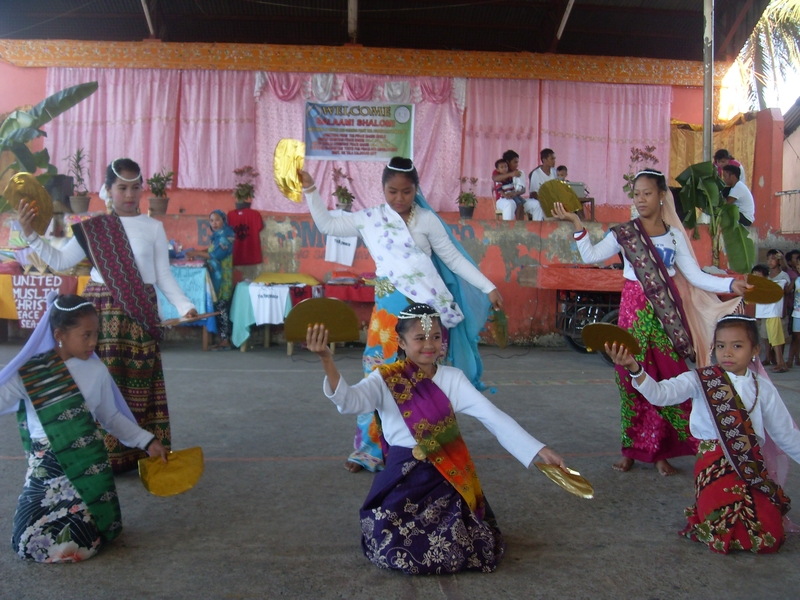 This was participated in by Muslims and Christians from the areas of armed conflict in the municipalities of Aleosan and Midsayap. They had earlier participated in a series of workshops on INTRA-FAITH Dialogue that inspired the creation of SALAM and SHALOM INTRA-FAITH DIALOGUE CIRCLES in their respective communities. 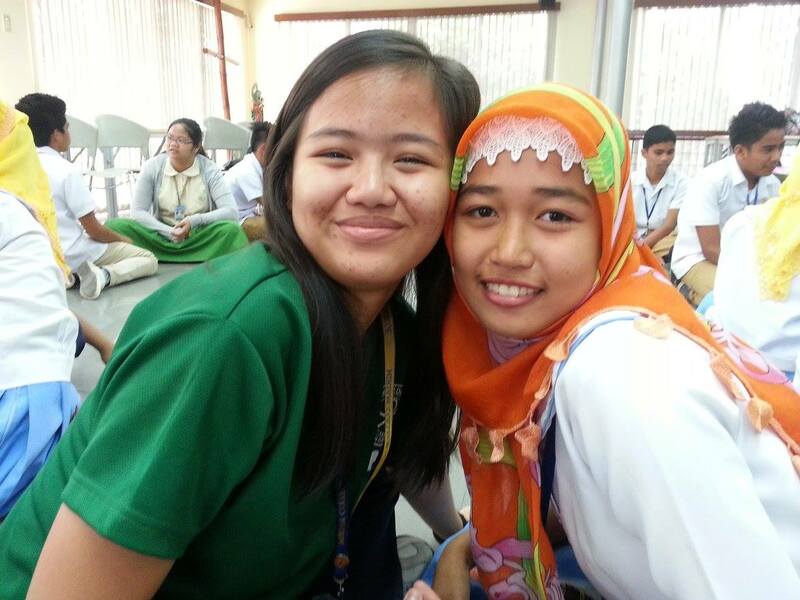 From January 30-February 2, they met and interacted with each other for the first time in an interfaith dialogue circle. They created safe spaces for engaging moral imagination in learning how to deal with their fears, anger, hatred, and mistrust of each other and be able to engage in mutually respectful dialogue and cooperation. 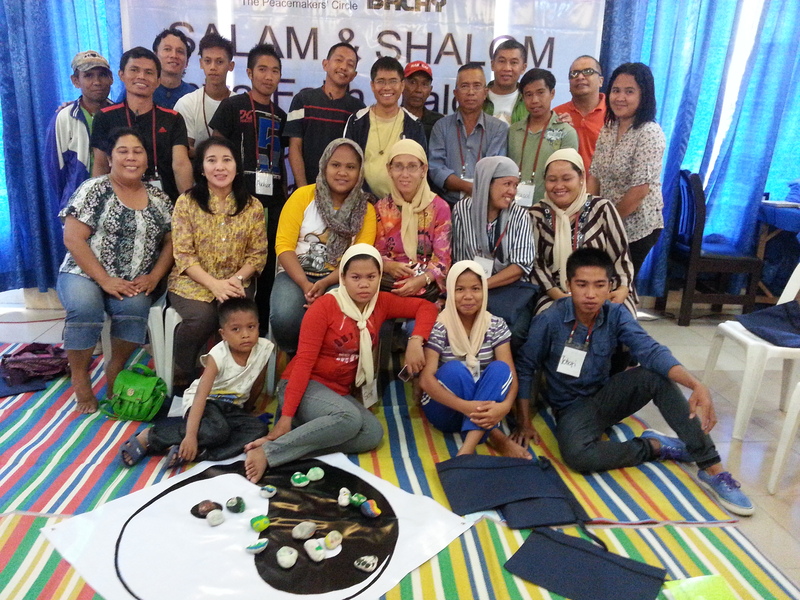 In Metro Manila, The Peacemakers’ Circle spearheaded and participated in various interfaith activities during the week, including activities organized by colleagues in the UNI-Harmony Partners Manila. 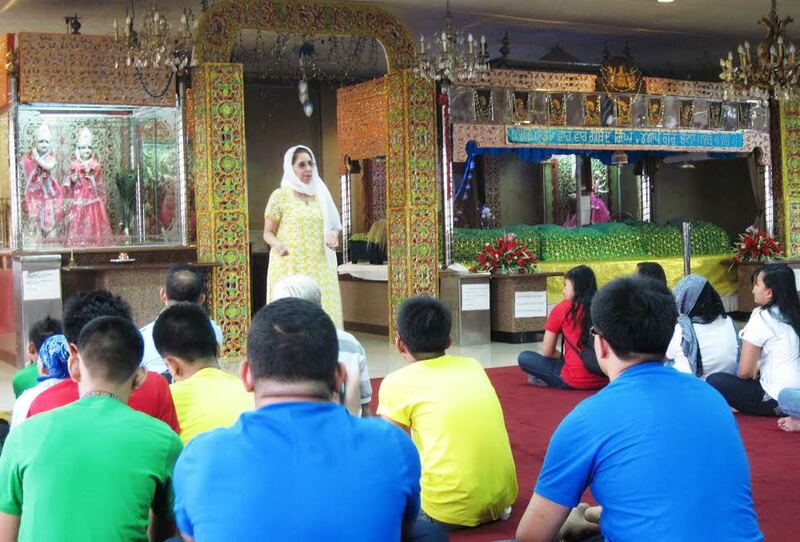 The Peacemakers’ Circle was represented by Shakuntala Vaswani in the celebrations at the Fo Guang Shan Mabuhay Temple on the theme “Love & Peace: Practicing our Faith.” She offered a Hindu prayer and spoke at the Symposium where leaders of different religious organizations were likewise invited to share their reflections on the theme. She also talked about how The Peacemakers’ Circle has been contributing to the endeavor of building a culture of peace and harmony in the world. The UNI harmony partners visited the Hindu Temple in Paco, Manila where Shakun Vaswani explained the rituals and symbolism in Hinduism to the interfaith group. Upon my return from the conflict-affected communities in North Cotabato, Mindanao, I conducted a workshop on Muslim-Christian Relationship-Building for the Catholic high school students of Miriam College and the Muslim students of Rajah Mudah High School of Pikit, North Cotabato. 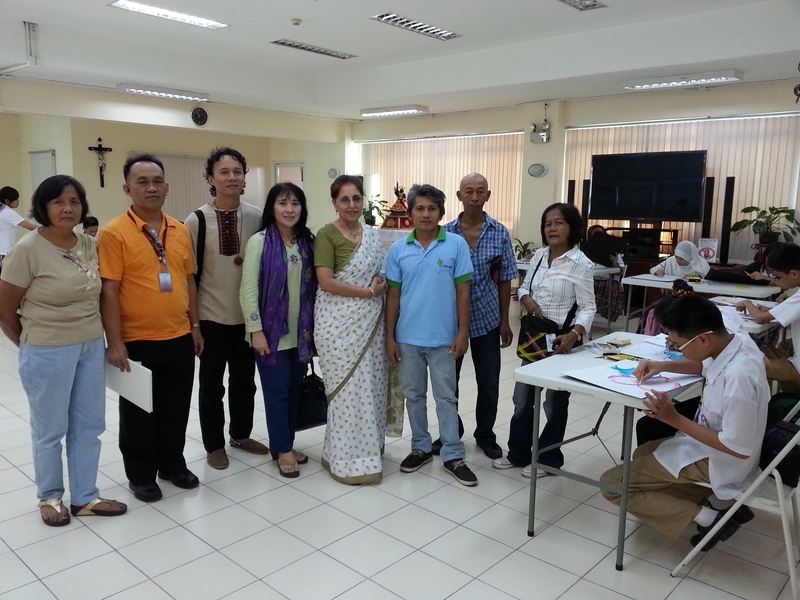 This was upon the invitation of Dr. Loreta Castro of the Miriam Center for Peace Education (CPE). 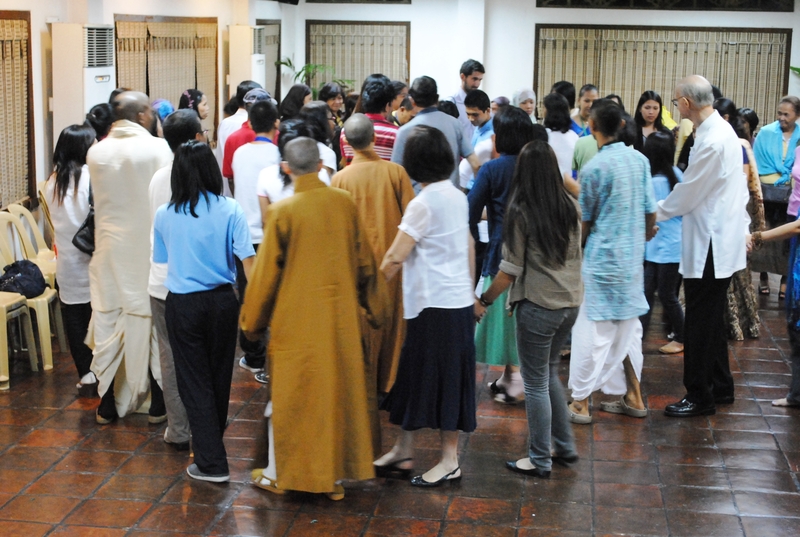 The Peacemakers’ Circle embarked on an INTERFAITH FRIENDSHIP PILGRIMAGE to different places of worship around Metro Manila. This was to renew bonds of friendship with members of the different faith groups and communities, and to introduce new people to their ways of worship. 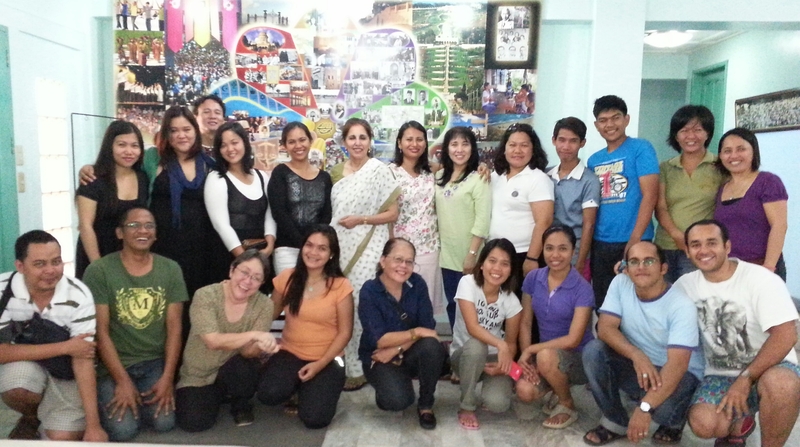 A group of twenty-four curious and excited Muslim and Christian members of Silsilah Manila joined the pilgrimage. It was their first time to experience being in places of worship other than their own. 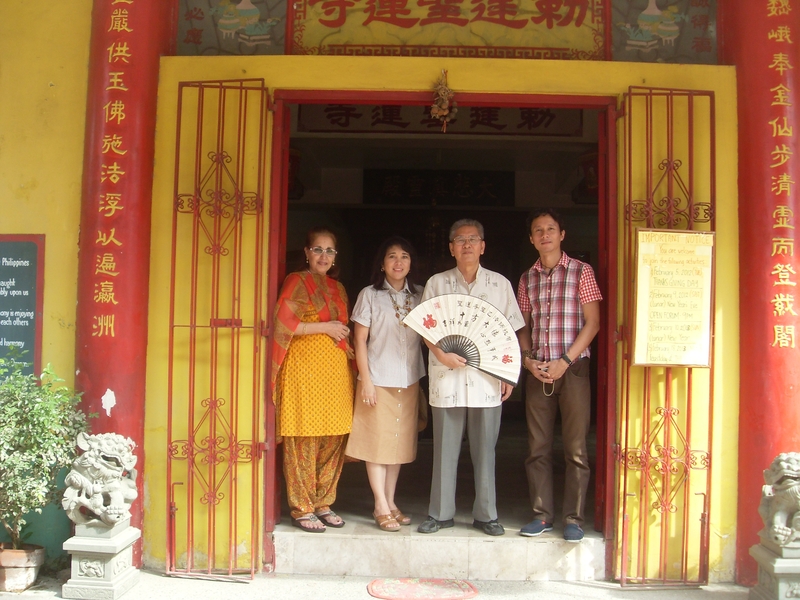 The first stop was the Sheng Lian Cho Taoist Temple in Quezon City where all were welcomed by Rev Wong Seng Tian, a known Chinese Astrologer and Feng Shui master. The children read with interest the astrological predictions for the year which were displayed on the walls of the Temple. Everyone was curious to know about the teachings of Taoism and about the central image of the Kuan Yin, Goddess of Mercy. They were happy to light incense sticks and eagerly offered their own quiet prayers in this strange but welcoming place of worship. Before they bade goodbye, Rev. Wong gifted everyone with packets of blessed chocolates. The next stop was at the Philippine Karma Kagyu Tibetan Buddhist Temple where Lama Damdul welcomed the party. With Shakun acting as translator, the Lama answered the questions about the deities in the Temple and the masters of the Tibetan Buddhist faith tradition. The group offered their prayers and received blessed food from the Lama. After receiving the offering, the eager young adults went outside to the Stupa and walked round it in the traditional way. 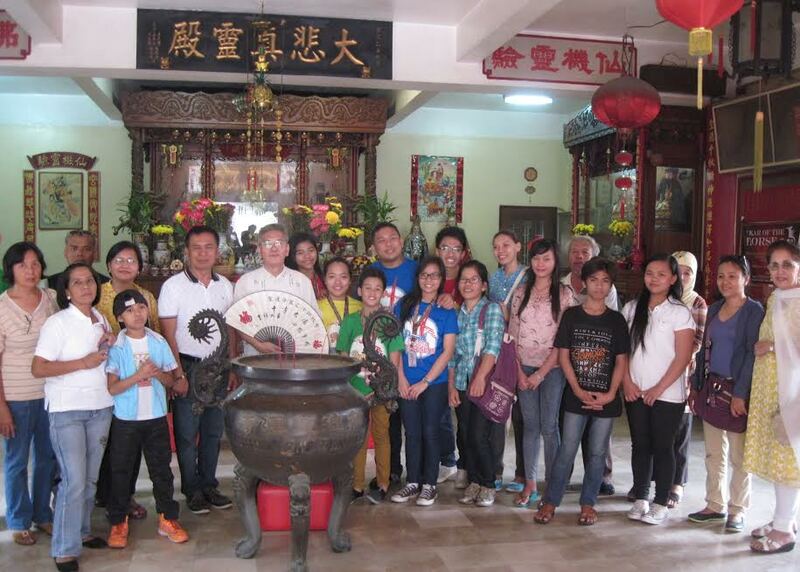 The final stop was the Hindu Temple in Paco Manila. 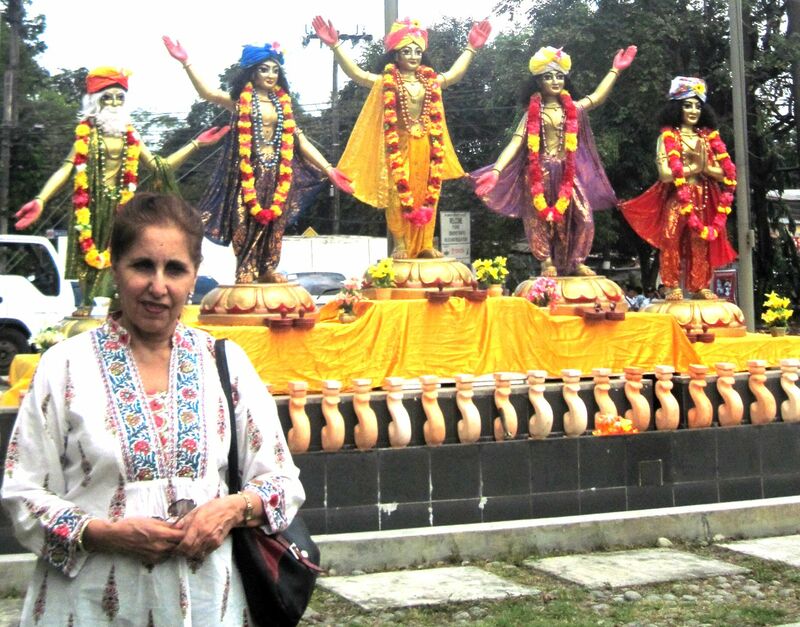 Shakuntala Vaswani welcomed the party and gave them an introduction to the tenets of Hinduism and introduced the various deities in the Temple. They were curious to learn more about the concept of Karma and Dharma. 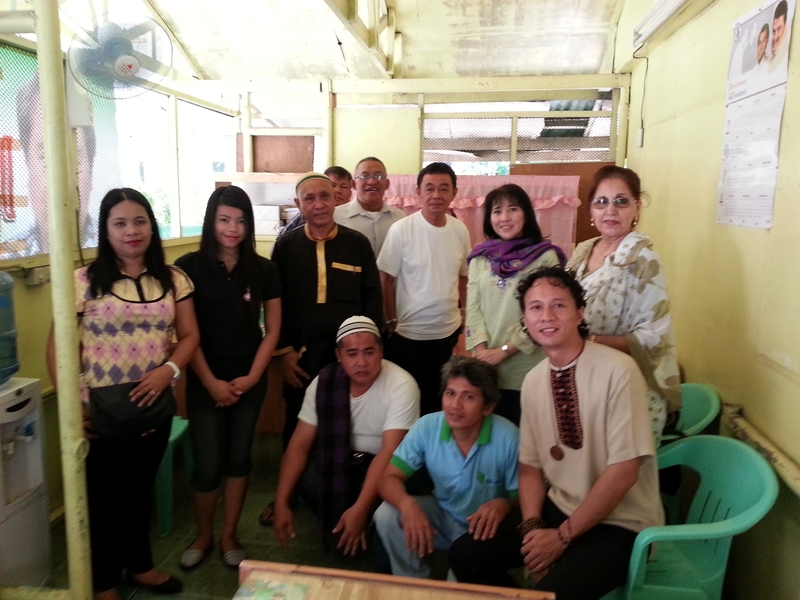 The friendship pilgrims of Silsilah Manila expressed appreciation and gratitude to The Peacemakers’ Circle for the experience of meeting Buddhists, Taoists, and Hindus at their places of worship and to learn about their faith. The leaders of the temples were likewise pleased by their visit and looked forward to the next. Later, at the Hindu temple, the crew from Solar TV Chanel interviewed Shakun on the contribution of the Peacemakers Circle to the endeavor of addressing conflict & violence in our society. The Focolare Movement organized an interfaith youth gathering in Tagaytay, but because it was a school day, the youth members of The Peacemakers’ Circle were unable to attend. Nonetheless, they extended their best wishes to the Focolare group in support of their endeavors for interfaith dialogue and peacebuilding. The Peacemakers’ Circle’s INTERFAITH FRIENDSHIP PILGRIMAGE continued. 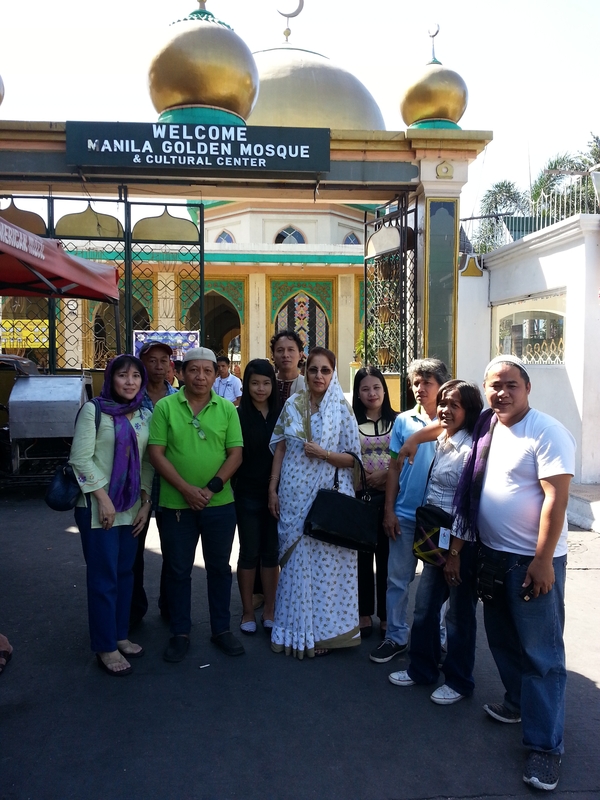 The first stop was the Golden Mosque in Quiapo, Manila. 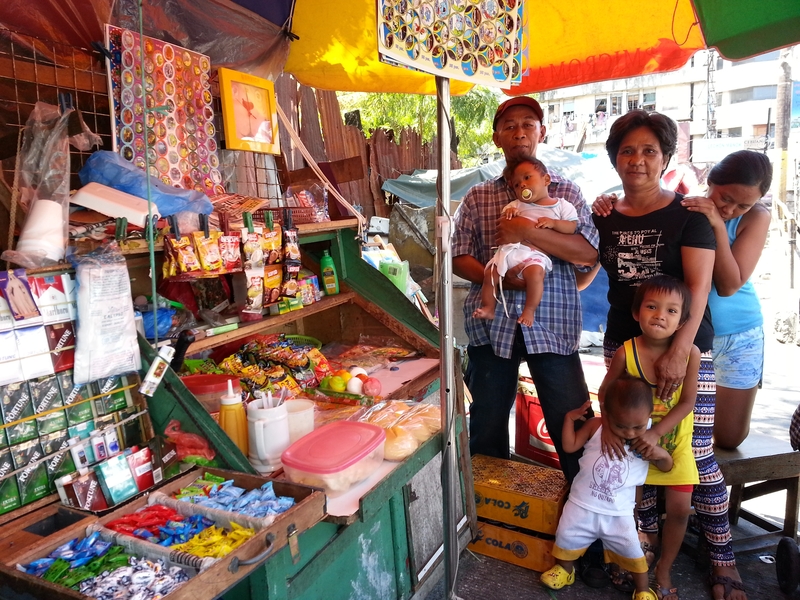 Going there, we had to take a walk along the busy streets of Globo de Oro where we were greeted here and there by friends from the Manila Muslim-Christian Peacemakers’ Association who were at their sari-sari stalls by the roadside striving to earn a living for their families. At the Golden Mosque we were received warmly by the assistant administrator and his officers, and they expressed their interest in supporting our Project on INTRA-FAITH DIALOGUE FOR MUSLIM-CHRISTIAN UNDERSTANIDNG in Mindanao. We were later graciously escorted to the mosque to offer our prayers. It was Friday, the busiest day in Quiapo. Right across the street was the Basilica of the Black Nazarene, and it was crowded with devout Catholics attending Mass. The streets were teeming with church goers and vendors selling their wares. We waded through the human traffic in the heat of the noonday sun to the Silsilah office where a Poster Painting Competition for the youth was going on. It was interesting to witness young adults of different faiths creatively expressing their hopes, dreams and aspirations for peace and harmony! Our final stop was the Baha’i center where we were warmly welcomed by Ador Newman and her vibrant group of Baha’is. Talk was interesting and we learned about how the Baha’is helped to address the need for values formation and spiritual strengthening among people in the grassroots regardless of their religion or faith tradition. 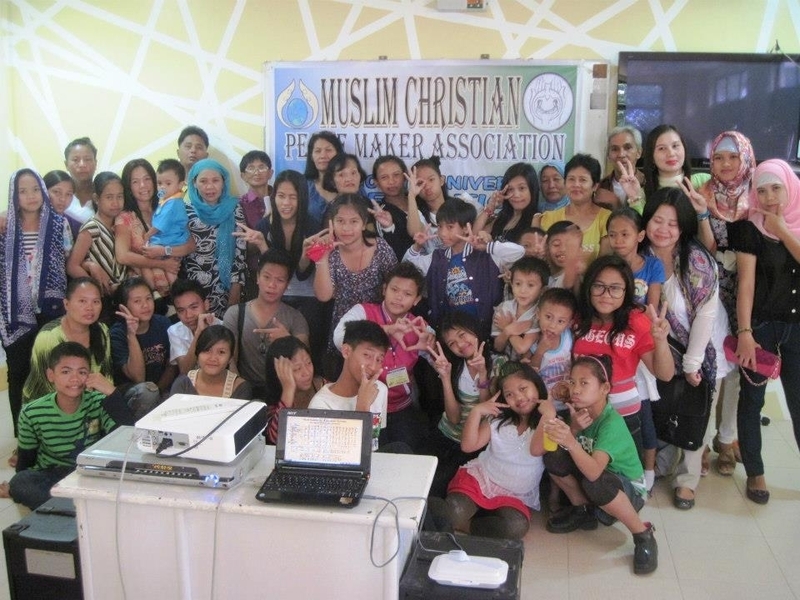 We were enthused by their willingness to conduct study groups for the Muslim and Christian youths in the grassroots community of Tala in Caloocan City. We have been serving the community for a decade and we feel that they are ready for another group to accompany them as well. Delicious vegetarian lunch was served us by our Baha’I friends. 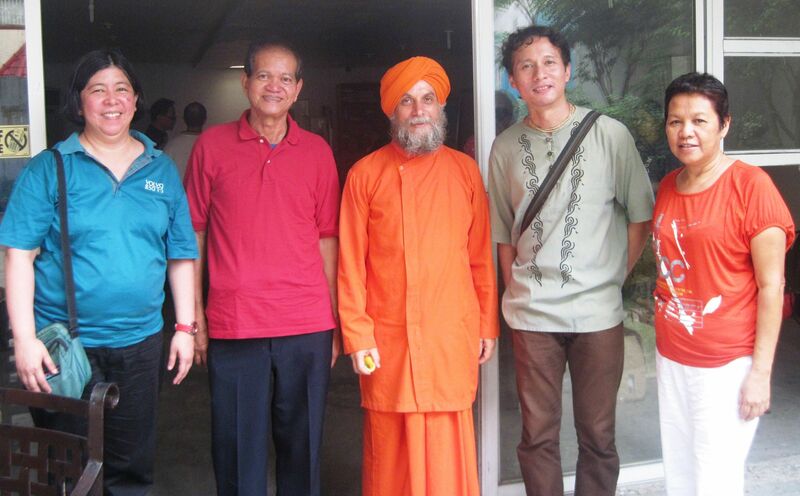 This was a heartwarming way to end the UN INTERFAITH HARMONY WEEK! Later, we returned to the familiar surroundings of our homes with hearts filled with hope for the enriching journey ahead of us! We look forward to its unfolding with gladness and anticipation! MAY PEACE & HARMONY PREVAIL in our minds and hearts, and in our ways of being in relationship with one another in the world!! THE PEACEMAKERS’ CIRCLE FOUNDATION, INC. 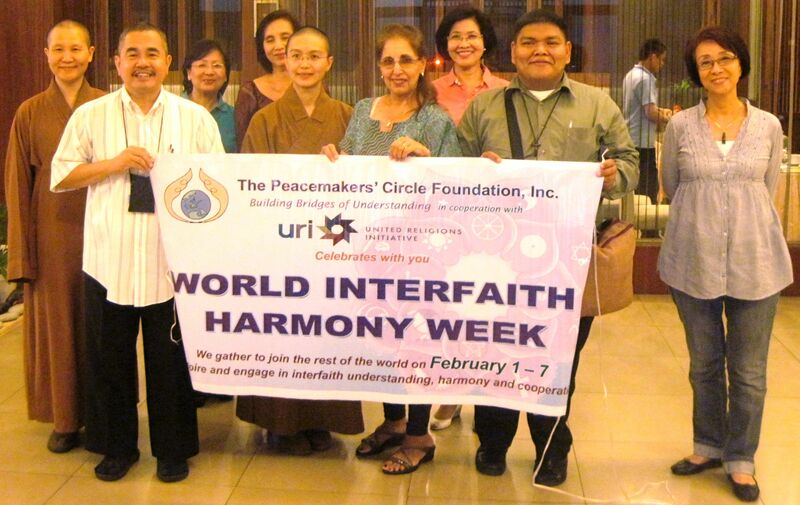 The first week of February was declared by the United Nations to be World Interfaith Harmony Week. For us at The Peacemakers’ Circle, this was another week—albeit more colorful, hectic, and picturesque than usual–in the life of our hopeful striving. 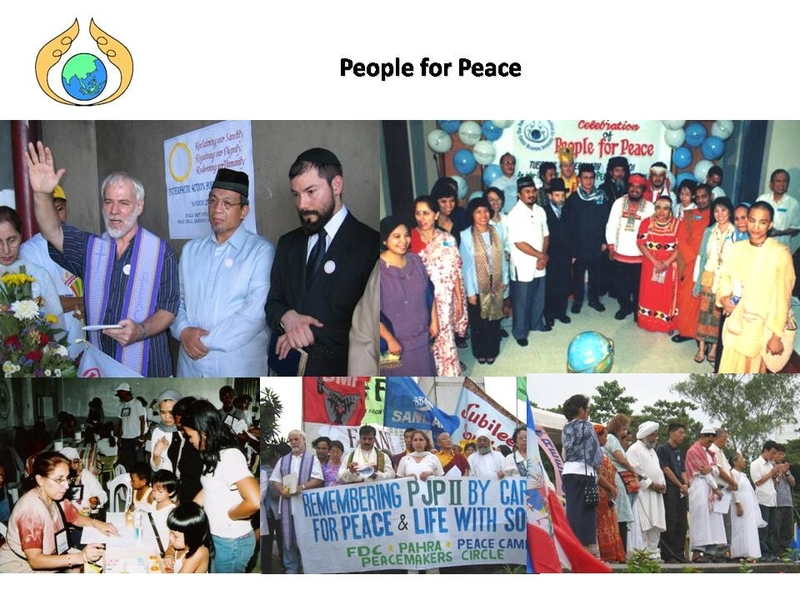 The Peacemakers’ Circle has been engaged in the endeavor of building relationships of mutual respect, understanding and cooperation between and among people of diverse religions and spiritual expressions since 2001. Like any human relationship, interfaith friendships cannot be built overnight. This is a co-creative endeavor that deepens over time among those who appreciate and honor the richness of diversity among people, and celebrate this in various ways. Diversity is apparent everywhere; it is in the divine scheme of things. This makes our relationships colorful and interesting, although often difficult and challenging. In our journey through life towards fullness in God, diversity makes every step not only exciting but growth-giving and awe-inspiring. In this spirit of excitement and awe, I share glimpses of this week’s activities as we at The Peacemakers’ Circle moved forward towards the realization of our shared vision of unity in diversity, and peace among religions. 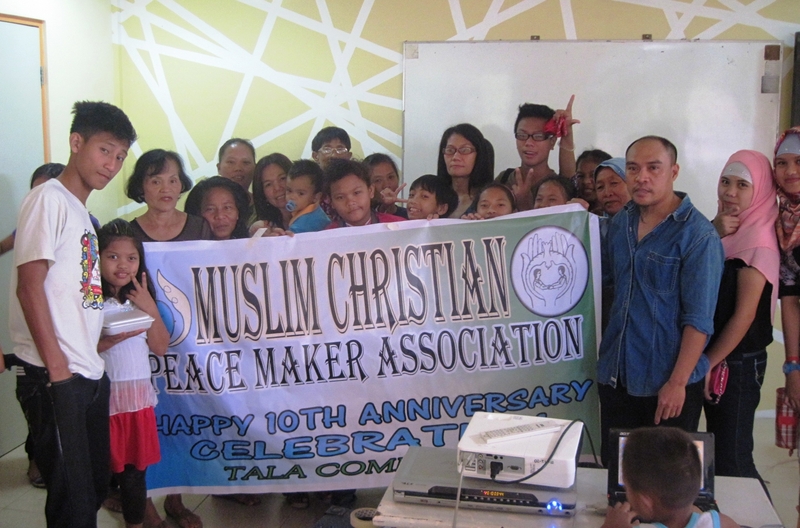 The Peacemakers’ Circle launched the week early with a “year opening” party organized by the members of the Muslim-Christian Peacemakers’ Association in Tala, Caloocan City. They were assisted by the youth participants of the leadership training project that was being conducted by The Peacemakers’ Circle under the Australian Embassy’s Strengthening Grassroots Interfaith Dialogue and Understanding (SGIDU) program. This was the beginning of The Peacemakers’ Circle’s Interfaith Friendship Pilgrimage 2013. 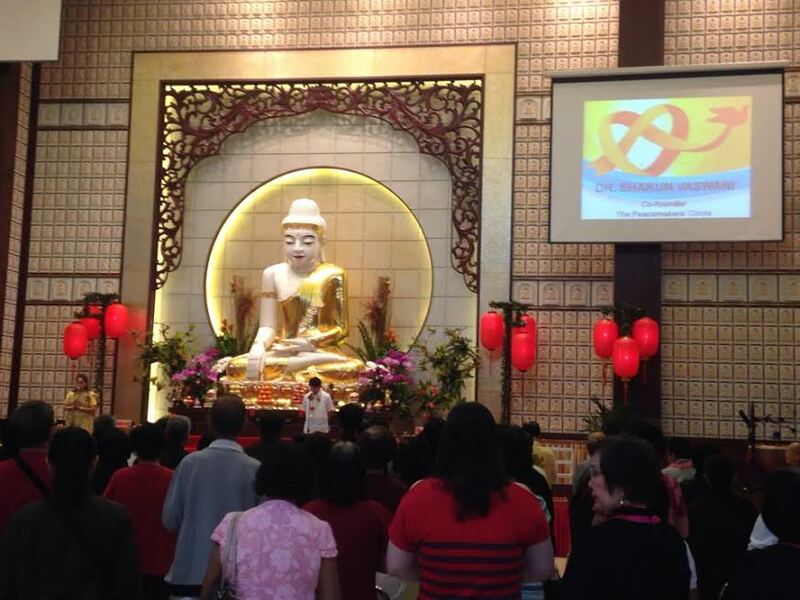 Our first visit was with our Buddhist friends at the Fo Guang Shan Mabuhay Temple. 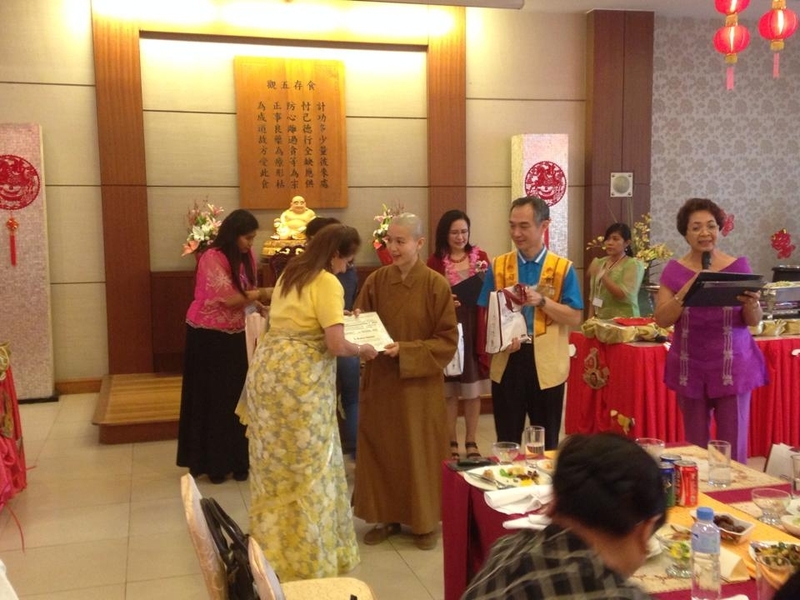 We were received warmly by Venerable Meio Jin and other leaders and members of the temple. We looked forward to returning on the eve of the 9th to join them in celebrating the Chinese New Year. Kung hei fat choi! This was a day of colorful spectacle as people flocked to the University of the Philippines in Diliman, Quezon City to experience the Festival of India. It was organized by the U.P. Asian Studies Department in partnership with the International Society of Krishna Consciousness (ISKCON). Everyone reveled in the unique cultural experience and enjoyed Indian vegetarian food, music and dance. Our team–Orlan, Shakun, Cecile and I–brought a basket of fresh oranges to give to our friends at the Ananda Marga Wellness Center in Sikatuna Village. We met with its director, Dada Premamamyanda, and his dedicated team of volunteers. They received us warmly like old friends would, and we enjoyed discussing our partnership in organizing our upcoming People for Peace program on March 14. It would be a celebration of the 12th year anniversary of The Peacemakers’ Circle. In the afternoon, there was a fun “year opener” activity in Culiat, Quezon City. 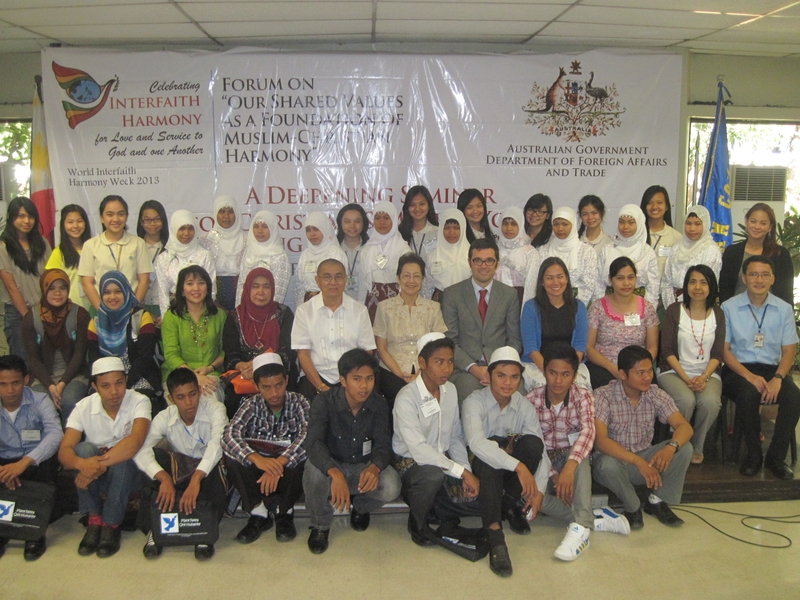 This was organized by the Muslim and Christian youth leaders who participated in the 2012 youth leadership training program of The Peacemakers’ Circle under the Australian Embassy’s SGIDU program. 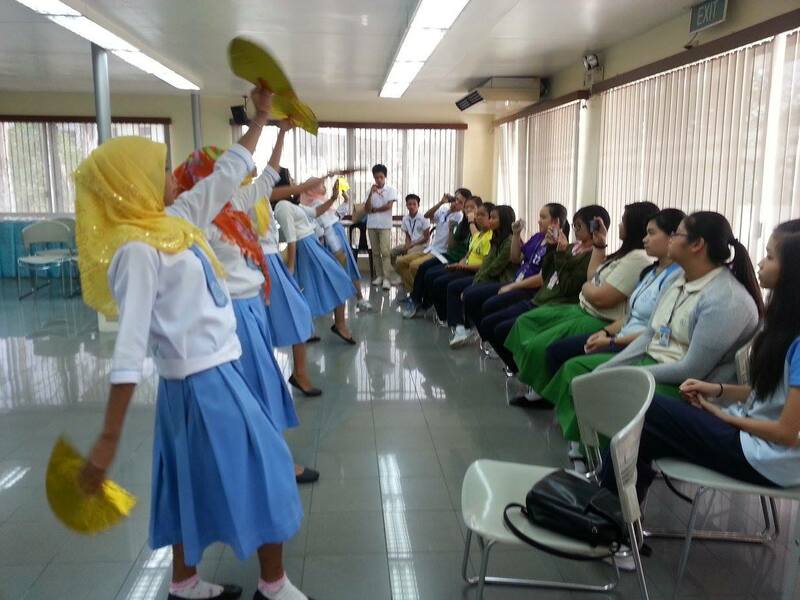 The Peacemakers’ Circle participated in a forum entitled: Our Shared Values as a Foundation of Muslim-Christian Harmony.” This was hosted by the Miriam College Center for Peace Education headed by Dr. Loreta Castro. Dr. Macrina Morados of the U.P. Institute of Islamic Studies presented views from a Muslim perspective, and I presented a Christian perspective. In the afternoon, Orlan and I conducted a “deepening” workshop on interfaith dialogue for Muslim youth leaders from Rajah Mudah High School (Pikit, Cotabato), and the Christian students of Miriam College. 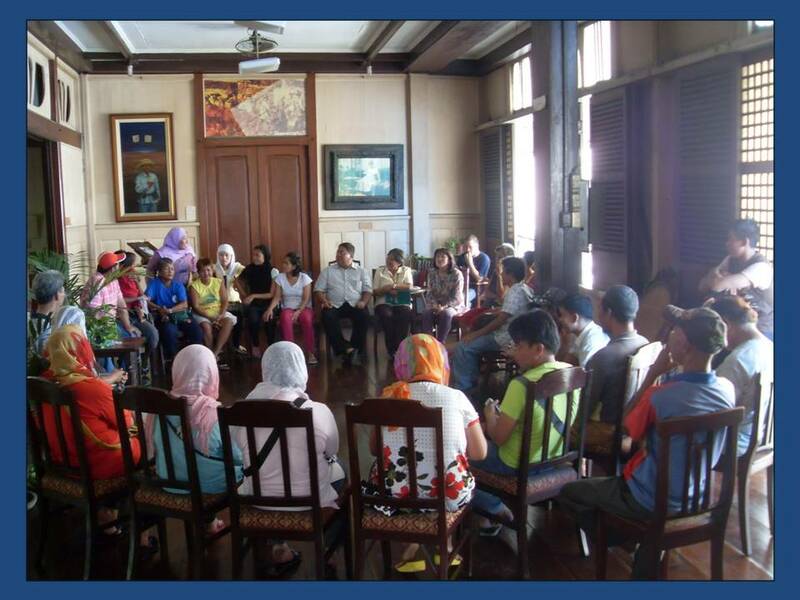 Orlan de Guzman gave an orientation to the participants of the Miriam Center for Peace Education on The Peacemakers’ Circle’s Muslim-Christian youth leadership activities in grassroots communities. On Wednesday (February 6), the students of Rajah Mudah High School visited the youth leaders in the community of Tala in Caloocan City. They had fun in each other’s company as they shared stories of hopes, dreams and aspirations with one another. Our next stop was at the Baha’I Spiritual Center where its director, Ms. Ador Newman, and a friendly group of Baha’is welcomed us warmly. After a lively conversation around the circle, we were graciously invited to stay for lunch. We enjoyed a sumptuous vegetarian meal prepared for us by Brother Kumar (a Bangladeshi), and Sister Phyotu (a lovely woman from Myanmar married to a Filipino). How gracious our hosts and how enriching our conversations! After lunch, we proceeded to Plaza Miranda in Quiapo, Manila to attend the culminating activity of the WORLD INTERFAITH HARMONY WEEK hosted by the Silsilah Dialogue Movement (of Rev. Fr. Sebastiano d’Ambra), the Parish of Saint John the Baptist (Minor Basilica of the Black Nazarene), and Religions for Peace (headed by Dr. Lilian Sison and Bong Baybado). We were welcomed by Msgr. 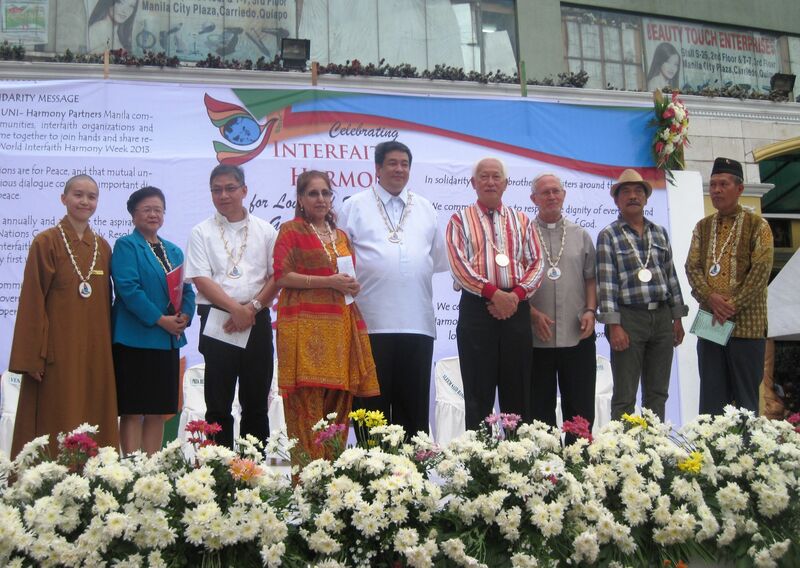 Clem Ignacio of the parish, and speeches expressing commitment to interfaith harmony and peace were given by representatives of the Buddhist, Islamic and Christian faith traditions. The Peacemakers’ Circle was represented by our very own Dr. Shakuntala Vaswani who also represented the Hindu faith community. Our dear friend and supporter, Fr. Carlos Reyes of the Episcopal Commission on Inter-religious Dialogue of the Catholic Bishops’ Conference of the Philippines (ECID-CBCP), spoke as a representative of ECID. Manila Mayor Alfredo Lim also graced the occasion and expressed his support for the endeavor to promote interfaith dialogue and peacebuilding initiatives in the City of Manila. The journey continues as we strive to “be the change that we see in the world” and to create common grounds where people of different cultures and beliefs can meet and speak. We carry on to create safe spaces where they can learn to appreciate and respect their differences, transform conflict into opportunities for growth, and build relationships of mutual respect, understanding and cooperation in their midst. 1. Check your heart. Ask yourself why you wish to engage in dialogue with people of other faiths. If your intent is not to convert them to your faith but to build mutually respectful and harmonious relationships with them, then your heart is in the right place. 2. Disarm, and make room within. Be aware of your prejudices, fears and apprehensions about relating with those who do not share your faith. Disarm yourself by making an effort to understand and accept those prejudices and fears, while also reaching out beyond your comfort zone to overcome them. Learn about the beliefs and practices of those whom you wish to engage in dialogue with, and find something in them that is good and admirable. 3. Prepare a common ground. Reflect on hopes, dreams and aspirations that you might have in common with those of other faiths whom you wish to engage in dialogue. Listen to your common humanity; underneath your unique identities, personalities, interests, and values, there are basic human needs that you share. Prepare to meet each other there. 4. Respect diversity, honor differences. Diversity is in the divine scheme of things. It is evident in nature all around us. There are trees that grow tall, shrubs that remain low, birds that fly and snakes that slitter, mountains that are high and low-lying meadows. Diversity is evident among people, too. They come from different backgrounds, races, cultures, beliefs, etc. Respect and honor those differences. They are what make our lives challenging and meaningful, our relationships enriching, and our world wonderful. 5. Invite and be gracious. Reach out beyond your comfort zone to people of other faiths and invite them to dialogue. Graciously and humbly share with them your hopes, dreams and aspirations for a better community, a better world. Invite and encourage them to share theirs with you, too. 6. Create safe spaces and build trust. Provide a “safe space” where people can feel assured that you accept them for who they are, and not for what you wish them to be. Prepare a neutral place to meet where no symbols or articles of your faith might be perceived as imposing or threatening. When engaging in dialogue with Muslims, it would be good if you remember to provide them with a place for ablution and a separate area for their prayers. 7. Listen deeply. Make time to be fully present and hear “the other” speak. Be in the moment, and hold no fears from the past or anxieties about the future. Be here-now. Focus your attention away from yourself and fully on “the other” by silencing your mind and engaging your entire being in deep listening. Be sensitive to the “other,” not only to the words that are being said, but also to the silences beneath those words. Humility, patience, and loving kindness are essential to dialogue. Though these attitudes of heart do not come naturally to some of us, these can be developed in time when one maintains the practice of listening deeply. 8. Speak humbly. Respond without haste from the silence of your mind and the listening of your heart. The heart is a place beyond words where oneness with the “other” can awaken us to love truly without fear, where compassion for our shared human condition can be experienced, and where deep respect and appreciation for the beauty and uniqueness of God’s creation can be beheld in each other with awe and reverence. 9. Appreciate uniqueness. There is beauty, divinity, and a sense of excitement and adventure in our human existence. Each relationship is unique just as each person in the relationship is unique. Building relationships with people who are different from our selves brings with it the challenge of inner growth and self-transformation. Learning to accept and appreciate our differences is a difficult process of “dying unto ourselves” so that “the other can be”. But to persevere in the endeavor strengthens organs of the soul that enable us to bear the gift of friendship and love for “the other” who may be different from our selves but with whom we share a common origin and destiny in God. 10. Inspire co-creative action. Interfaith dialogue is about relationship-building. Good and steadfast relationships are built on the foundation of trust. When we trust that we can be ourselves and not be expected to be like the other, when we can accept our differences and be mutually respectful and appreciative of each other’s uniqueness, then our journey together will lead us to places in our hearts where we can be one. We can unite in our efforts to find co-creative ways of bringing about a peaceful, harmonious and better world for ourselves, our children, and our children’s children. 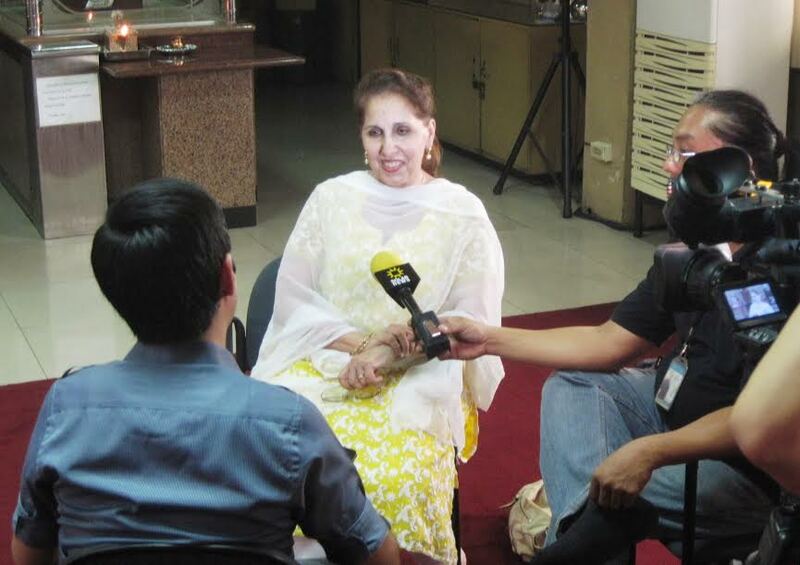 On October 18 (Friday), The Peacemakers’ Circle, together with the Focolare Movement and Sanghabi, helped Rev. Fr. 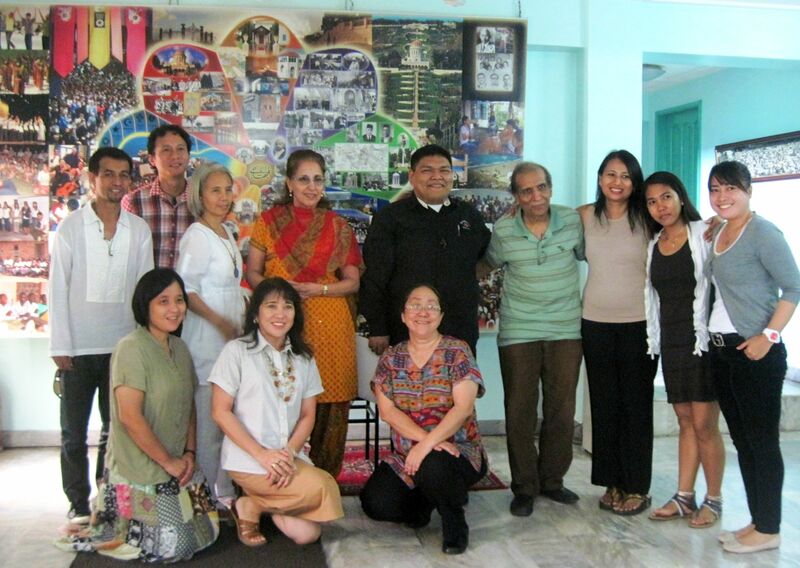 Carlos Reyes organize an interfaith gathering on LOVE & FORGIVENESS for the Episcopal Commission on Inter-religious Dialogue (ECID) of the Catholic Bishops’ Conference of the Philippines (CBCP). 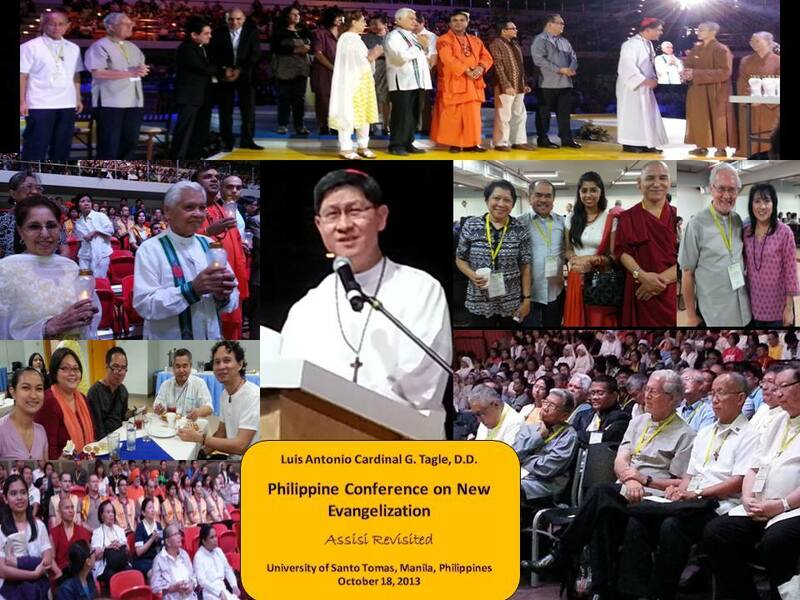 It was a culminating activity of the 3-day Church Conference on New Evangelization, and this was attended by about five thousand Catholics from around the country. 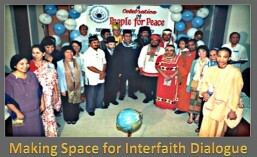 We at The Peacemakers’ Circle (led by Orlan de Guzman, Jr. and Sanghabi) were privileged to have been part of the opening prayer ritual of the interfaith program. 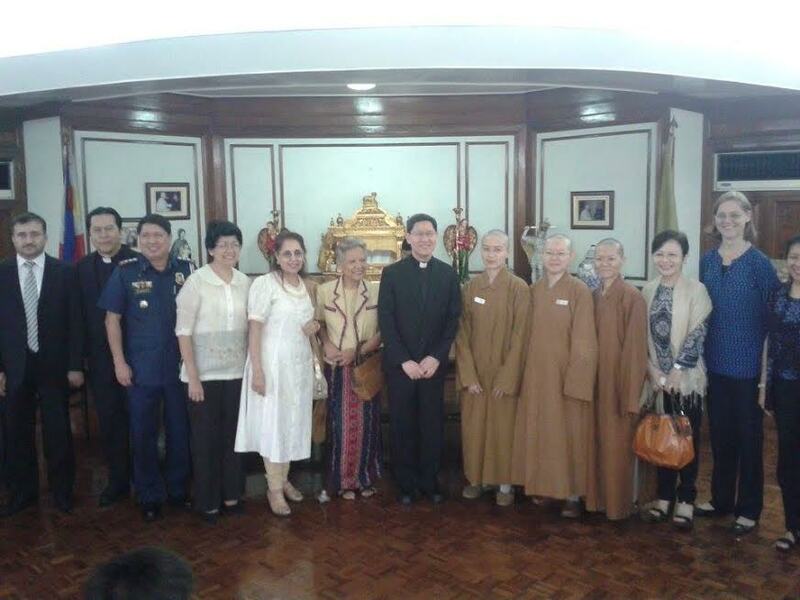 Later, in his testimonial, Cardinal Tagle, Archbishop of Manila, asked for forgiveness (for the sins of the Church) from the leaders and members of the different religions and faith traditions who were present. He was well applauded, and some of the members of the assembly were visibly moved. Congratulations Fr. Caloy, Ted and Asela Arago, Fr. Richard Babao, Val Brillo, Bong Baybado, Orlan, Leo, Reimon, Jackie of Sanghabi, Sharon, Shakun, Tomomi, Norio, Imam Moxsir, Aleem Said Basher, Tet Gallardo, Lama Damdul, Sister Becky, our friends from Ananda Marga, Venerable Miao Jin, Dada Premanayanda, and all our friends in the interfaith community who were there to help make the event memorable!